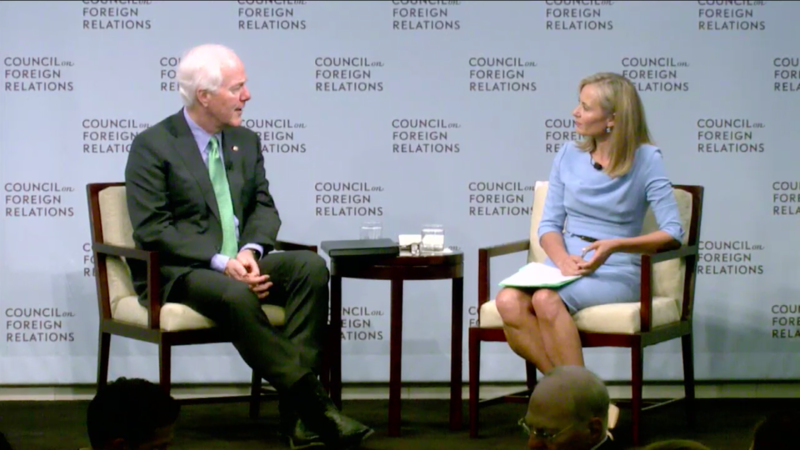 Yesterday at the Council on Foreign Relations, I had the honor of interviewing Senator John Cornyn (R-TX) on his plans to “modernize” the Committee on Foreign Investment in the United States (CFIUS). In his opening remarks, Mr. Cornyn admitted CFIUS is working reasonably well, but that there are many gaps being exploited by countries, such as China, in order to leapfrog technology. Left unchecked, our military’s competitive advantage could erode, and our national security would be undermined. His legislation, known as the Foreign Investment Risk Review Modernization Act (FIRRM Act), is a “measured approach to close those gaps” and modernize the review process. A self-described free trader, Mr. Cornyn said his legislation is not an attack on foreign investment or free trade and is neither economic protectionism nor intended to advance the notion of economic reciprocity. Yet updating the CFIUS process, he believes, is part of a necessary overall strategy to better protect our national and economic security. The legislation will not single out any countries or specific technologies but will expand the scope of projects that can be reviewed. He cited that real estate deals might now be subject to review, given concerns that certain countries are acquiring land near military installations. And that joint ventures established by U.S. companies with foreign partners overseas could also be subject to CFIUS. Greenfield investment would still remain outside the scope of CFIUS in order not to block the creation of jobs in the U.S. Asked about examples of deals that he thought should have been blocked by CFIUS, Mr. Cornyn responded that he is “agonistic on deals”; rather, the legislation is intended to capture more investments. He further noted that no ownership thresholds are set forth and that they are not concerned about passive investments. While no countries are named in the legislation, he did single out China throughout his comments saying its government is “weaponizing investment” and systematically acquiring U.S. technology to exploit the gaps in our legislation to invest in order to gain a technological advantage. In briefings, he noted that Defense Secretary Mattis and other leaders in the security and intelligence fields have detailed how China is making strategic investments in sensitive technologies. In the unimaginable event that we had a military conflict, we could potentially see U.S. technology being used against our military. For example, there are early stage investments in technologies that CFIUS does not capture currently, and coverage should be extended to venture capital investments. As the CFIUS review process is transactional by its nature, if it is going to be effective in dealing with the systematic approach by foreign countries in acquiring U.S. technology, it is clear that the new legislation needs to be one part of a larger strategy. In addition, it is not clear how this new legislation provides coverage that is not already permitted within the existing legislation. For example, CFIUS has been used to review acquisitions in a pork processing plant, where it is not inherently evident as to why this investment would qualify as a threat to our national security. The challenge in developing the legislation will be to balance the benefits that accrue to the U.S. economy from an open investment environment with potential threats to national security. This legislation must stay focused on the national security concerns, as there are other means of dealing with the economic and trade-related issues with countries such as China. About the timing of the legislation, Mr. Cornyn responded that they are putting the final touches on the text and ensuring that they are reaching out to the business community and foreign policy experts for input. He is confident there will be broad bipartisan support for the bill, and announced that Senator Gary Peters (D-MI) will be a co-sponsor and is optimistic others will join. Asked about whether he has spoken with President Trump about the legislation, he answered that the White House has been generally supportive of the effort to address CFIUS and that he has been coordinating closely with Treasury, the CFIUS lead. He gave no time frame for submitting the FIRMM Act instead saying that he wants to make sure to “get it right”.